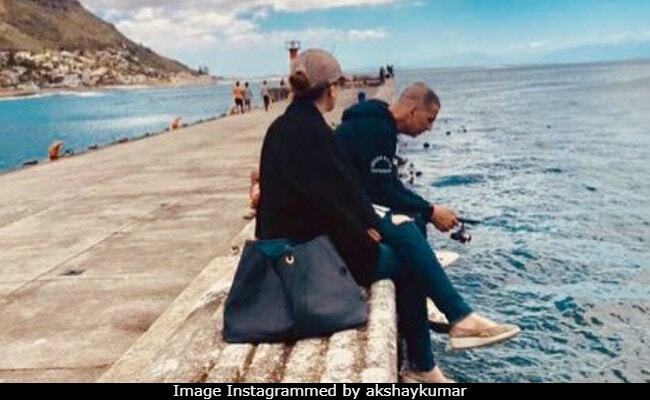 If you're looking for Twinkle Khanna and Akshay Kumar, the couple are holidaying in Cape Town ahead of the actress-turned-author's birthday. Twinkle Khanna will celebrate her 43rd birthday in the African destination on Friday. Sure there will be birthday celebrations but before that, it's time for some peace and quiet, and fam-jam. Both Twinkle and Akshay have been making entries to their Cape Town 2017 diaries. When on holiday, Twinkle explored her adventurous side as she climbed up a tree with other partners in crime in tow. "I want to be like a child again-to climb trees and perch on branches, only because the tree exists and so do I," she captioned her recent Instagram post. For his latest post, Akshay wrote: "Deep blue sea and skies to match, long conversations and fishing for a catch." In the photo, Akshay and Twinkle can be seen chilling by the sea waters and crystal blue sky. Akshay Kumar had announced his arrival in Cape Town with an adorable post featuring Nitara and Valentino - the son of their house help in Cape Town. "Happiness is meeting an old friend and starting exactly where you left off :) Nitara meets Valentino 2.0," he wrote. It appears, just like last year, Twinkle will have small birthday celebrations with a close-knit circle of friends and family. Happy Birthday in advance, Twinkle Khanna, and we are looking forward to pictures from your big day! Twinkle shares her birthday with her superstar father Rajesh Khanna, who died in 2012. Akshay will presumably resume his PadMan duties after he returns from Cape Town. Directed by R. Balki, the movie is produced by Mrs FunnyBones Movies and also stars Radhika Apte and Sonam Kapoor. It is slated to hit screens on Republic Day.